Super excited to finally share this. Over the past 6 months I’ve been working with Target creative on a concept for a painted mural going up in (the first ever) Target in Burlington, Vermont. This project was amazing on many levels. It was my first painted mural. Something I always wanted to try but haven’t had the opportunity. A huge, scary first shot but I was able to connect with other local artists who helped make this whole process run smoothly. Big Thanks to Cara Benson and Ted Halbur @target for the opportunity. 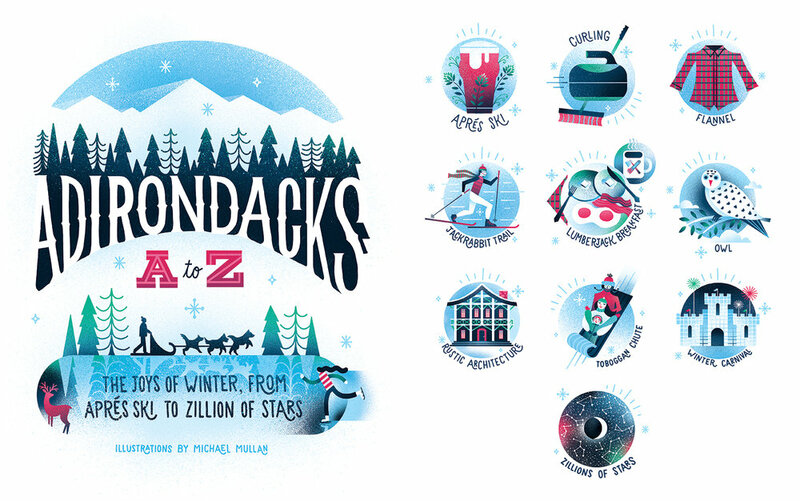 I'm excited to share a new series I worked on recently in collaboration with the art directors at Adirondack Life. This project was especially fun since I've experienced a lot of what the region has to offer. From the giant ice castles at Winter Carnival in Saranac Lake, to the Toboggan Chute in Lake Placid, no where celebrates winter like they do in the Adirondack's in upstate New York. Big thanks to Kelly Hofschneider + Niki Kourofsky for the opportunity! It's been a long time since I've shared anything on here (partly because I've been neglecting social media) but also because a lot of what I've been working on has been top secret... and ongoing. 2017 was definitely the busiest year yet. It was filled with tons of fun projects + new clients, which challenged me in ways I'd never been before. My illustrations fell into just about every format I could have imagined from beer packaging, to greeting cards, children's books, store signage, + animation. There were times I felt like I bit way more off than I could chew and felt the pressure from many different angles. But all were amazing opportunities + great learning experiences that I'm very grateful for. Thanks to everyone who took a chance on working with me this year. I wish you all the best in 2018. Since starting up their one-barrel brewery in 2015, UPPER PASS has quickly grown to be one of the most popular breweries in Vermont. First Drop + Cloud Drop are two of the most sought after beers in the state. They've since upped their production to a larger brewing system and expanded distribution statewide. Their beer has even appeared in limited-release in NYC + throughout New England. I'm super lucky to have been with them since their formation to watch this awesome progression. They've given me the opportunity to collaborate on 4 can designs in the beer line-up. Bringing their brand to life has been one of the most fun + rewarding experiences yet. I look forward to seeing where they go next! MATALAN is fashion + homeware retailer based in the UK. Since the start of 2017, I've worked with their design team on holiday art for Christmas, Easter, Mother's + Father's Day, + Halloween 2017, as well as rebranding their Kid's program. The designs were used as in-store signage, product packaging, + web marketing. Check them out on their online or in stores if you're in the UK! This was my first stab at creating animatics, character designs, and background art for an animation short. 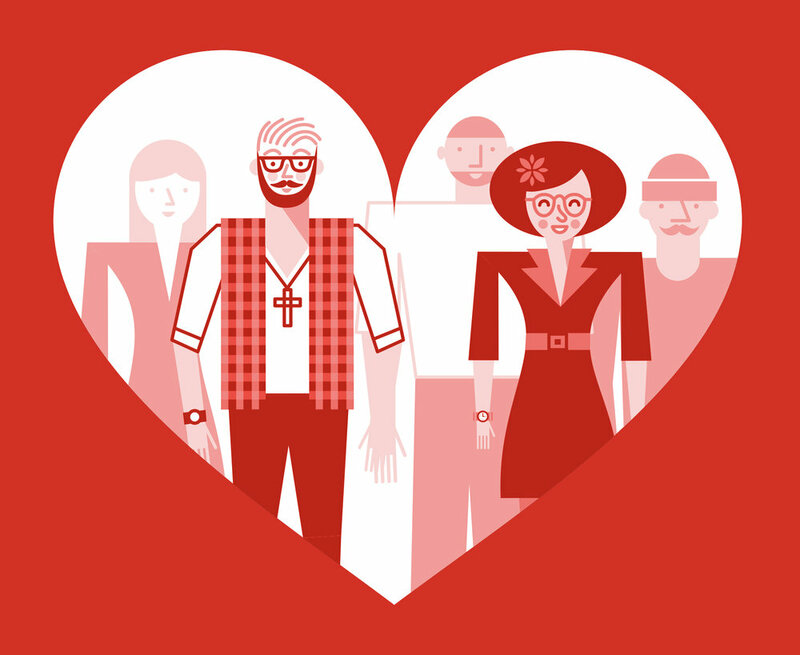 My illustrations were brought to life by the talented folks at Ox Creative for Barna Group. The video (seen here) was to be used for the opening greeting at the 2017 Illinois Pastor's Conference. The concept shows the transition of leadership within the church from one generation to the next. Through color, it communicates how Millennials in leadership roles can influence the church by making it more fun + inviting to younger generations. Conceptually, this was definitely a challenge. I'm really happy to have this opportunity and hope to work more in this realm in the future! It's awesome getting to know the lay of the land whether it's on a local, state, or national level. I love to travel and see new places, so researching all of the best, most iconic spots across the country and abroad is a win win for me. So far, I've illustrated the USA in various forms as wall art for my friends at Wild Apple. 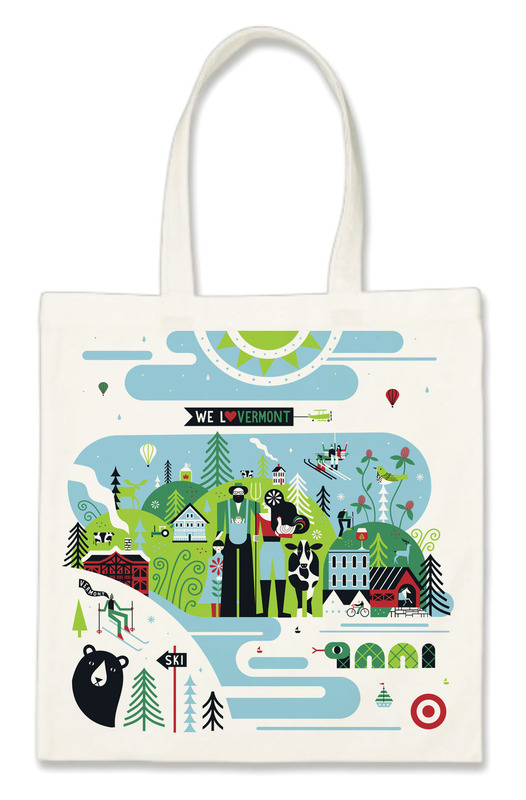 From there, I've gone on to illustrate Vermont, Wisconsin, and, most recently, Virginia for Hallmark. I'd love to finish all 50... someday. Spruce Peak at Stowe working alongside HMC Advertising brought me on to help with illustrating a map of their property. The Spruce Peak at Stowe property map shows an aerial perspective + imprint of the buildings. The map serves to help guests find their way to shops, restaurants, skiing, + tons of other fun offerings at the Resort. Top: Small Happiness for Il Corriere Della Sera, Italy. This illustrates the practice of taking joy in all things big and small. Middle Left: UFO's (Unrecognizable Fiendish Onslaughts) for New Era Magazine, UT. This illustrates negative habits and behaviors to watch out for and correct if necessary. Middle Right: Comfort Food for Experience Life Magazine, MN. This illustrates healthy foods to eat to help suppress symptoms of anxiety + depression. Bottom Left: Wacky State Laws for US Reader's Digest, NY. This series of six illustrates actual, real life state laws that exist currently. Bottom Right: My Lifeline for New Era Magazine, UT. This illustrates a woman's struggle to find happiness through the church. 50+ spreads, cover art, + an illustrated map with tons of fun kid's activities to be released by Quarto Press + Ivy Kids in 2018. I've been slowly chipping away at this project all year so I can't wait to see it in circulation. This should be a ton of fun for patriotic kids ages 6-12! Loved seeing my Work + Play illustration as a wall installation. It looks great! I'm super excited to be able to share the product of many months in the making. 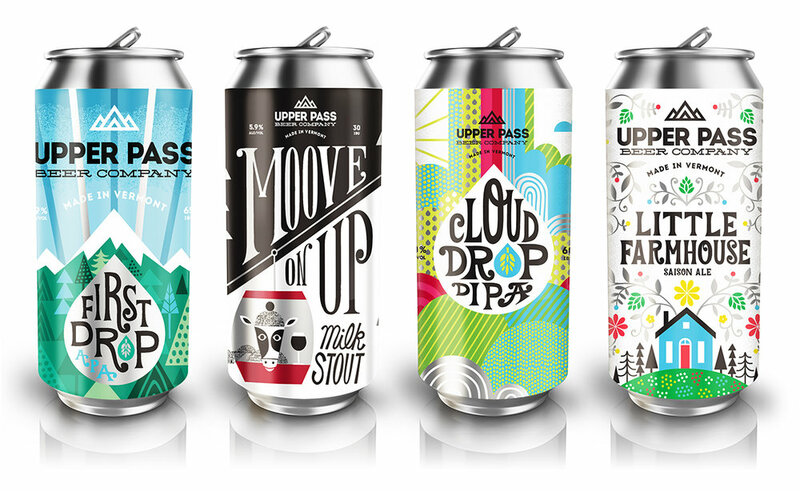 Last year, I helped develop the logo identity for Upper Pass Beer Co. And now, I'm very grateful to be given the opportunity to help develop their beer packaging. Big thanks to Andy, Chris, & Ivan for working this through with me. They are awesome dudes who make some top notch beer tucked away in the green hills of Tunbridge, Vermont. For more on Upper Pass Beer Co. check them out here. I've had a string of amazing projects lately. This one came to me from the Great Smoky Mountain Association. They asked if I'd be interested in creating cover art for a new bluegrass album featuring newly covered tracks of classic Appalachian music. I'm a huge bluegrass fan so this one was absolutely a project that merged interests. Big thanks to Lisa Horstman @ GSMA for letting me be a part of this! The album has been getting some great reviews. Rolling Stone did a write-up of Dolly Parton's cover of Little Rosewood Casket which debuts on the album. Have a look ---> here. Have a listen ---> here. Prints + canvas are available in my shop. I'm excited to announce my portfolio LOOKBOOK is available to view & download. Inside is a selection of my favorite projects as well as some insight into my inspiration & thought process. Printed copies are available upon request. All Artwork Copyright © Michael Mullan. 2016. All Rights Reserved. This is a new editorial for The Washington Post. The article is about the aging rock n' roll generation and the passing of musicians, David Bowie & Glenn Frey. New editorial for Italian publication Il Corriere Della Sera. The article is about ending a close friendship. This is a personal piece created as part of a series about highs and lows of ultra marathon running. Earlier this year, I was contacted by The Ad Store in Hamburg, Germany to collaborate on a 2016 company wall calendar for EOS Group. The calendar features 12 artists, each illustrating a different aspiration. My contribution is an abstract take on open-mindedness, thinking outside the box, & welcoming challenges. I'm so happy to have been a part of this! Vermont is a pretty awesome place to be in the fall. The colors are intense... maybe not this intense in real life but you get the idea :) Enjoy it while it lasts! Last year, a few of my Paris illustrations were selected to be included in the book Everyone Loves Paris. This year, I’ve been lucky enough to be featured the follow up Everyone Loves New York. A big thanks to Leslie Jonath at TeNeues Publishing for asking me to be a part of this. The books is filled with great art that perfectly captures the life of the city. It's not too word heavy and lets the art shine (which is exactly how I like it). Many of the contributors are big influences of mine so it's a big honor to be included. Here are some of my favorite spreads. Happy to share a new spread for New Era Magazine. The concept illustrates the power of music and how it can have a negative impact on your mood & overall outlook. But mostly excited for my friends and family everywhere who can be free today. Congratulations all!